Skinny jeans in classic indigo denim, crisp summer whites or bold reds and oranges make great style canvases. Dress up sleek skinnies or add distressed interest to outfits for flattering leg-lengthening fashion. Skinny jeans contour the body with an amazing leg stretching effect, as well as giving all year round basics to dress up or down with a quick change of tops and shoes. Men's skinny jeans are slightly less figure-hugging than women's but fitted enough to give a good style balance to chunky jumpers, longline T-shirts and oversized bikers. Partner white or grey skinny jeans with sharp shirts and colourful silk ties for crisp summer office looks or give an edge to off-duty wear with distressed designs, a men's denim shirt and the slightly rumpled look of a linen blazer. Knee-holes or doubled back cuffs add instant interest to skinny jeans giving a cool factor to the simple combo of jeans, tees and ballerina flats. Customise hems on skinny jeans with frayed or slit finishes that show off statement heels, add a sequin top or boho blouse and accessorise with bold earrings and you're ready for hot date nights or cocktail hour. Brighten up any season with boldly coloured jeans partnered with cream or ivory tops and throw in a splash of leopard skin with shoes, scarves or bags for a catwalk tweak. Work smart office style with black or grey high-waisted skinny jeans. Then tuck in a silk blouse, keeping the look professionally smart with mid-height heels or sleek ankle boots and a tailored blazer. 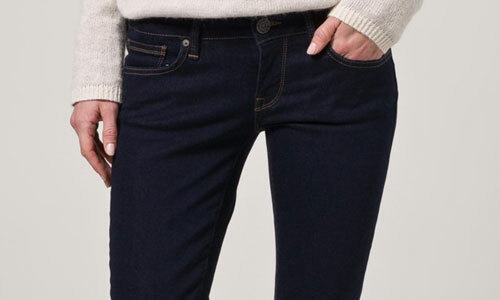 Bootcut jeans can be identified by the slight flare at the bottom of the leg. The flare is subtle however, and almost gives the appearance of a straight legged jean. Boyfriend jeans are the ultimate in comfortable, casual style and often feature large pockets. The intended look is one that appears a little too big for your frame. Regular fit jeans are the go-to pair for a classic, casual look. Straight legged, they are not too loose or tight. Loose fit jeans are perfect for those who look to keep their wardrobe laid-back. Leaving room for freedom of movement, they are comfortable to wear. Drainpipe jeans are another 90s classic, narrow from the hips to the ankles. The tight fit looks good offset by oversized knits or chunky shoes. Denim shorts are popular with tights in winter as well as summer. Tight or baggy, it's up to you! Skinny jeans are close fitting and give the impression of longer legs. Heralded by Indie kids in the early 2000s, they remain one of the most popular jean styles amoung fashion devotees today. Straight leg jeans are the close relation of the bootcut style. 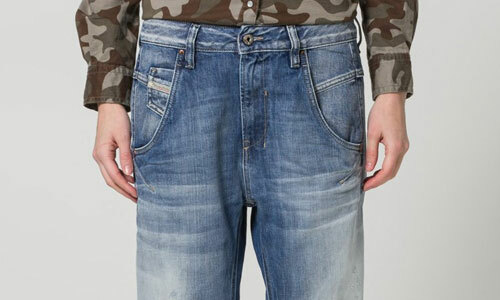 The trouser leg is completely straight, so much so that the jeans appear narrower at the ankles. Tapered jeans narrow or ‘taper’ in towards the ankle. They are usually made of a softer denim or material and are perfect for those who like to their style to stand out.